This revolutionary growth stimulator is rich in vitamins, coenzymes and enzymes. 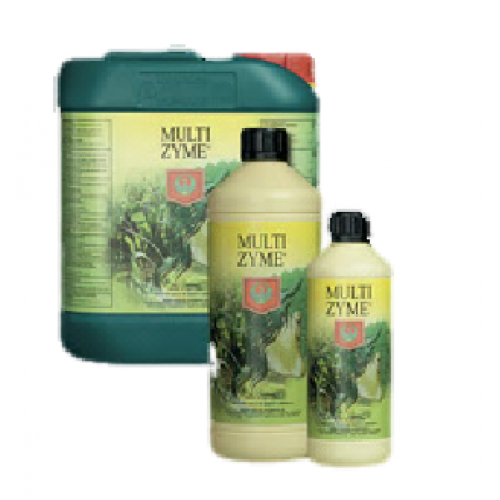 House and Garden MultiZyme is used to simplify, yet accelerate, the growth process by getting rid of dead root matter. It is also beneficial to helping your plants fight against diseases. With high levels of protein and humic acid, MultiZyme stimulates the roots for fast growth and development. The relaxing properties of this growth stimulant will reduce the stress levels in your vegetation, therefore producing an abundant and healthy harvest that is sure to be pleasing to the eye, as well as the taste buds. The collective enzymes in House and Garden MultiZyme assist in converting the base nutrient into micro nutrients for your plant. Enzymes assist with the plants ability to process natural sugars throughout the entire growth process. Farmers and gardeners alike rave about the effectiveness of this revolutionary product. Directions for use: Prepare your growth container as per usual then add your base nutrients. After adjusting the EC, add MultiZyme, being sure to then properly adjust the pH levels. You can use MultiZyme during the entire growth cycle. Follow directions on the label per your specific type of crop.